'Bruno' is a lovely Blue Roan boy, he has a super character and is producing strong puppies with excellent temperaments. He is Optigen 'A' Clear for PRA and FN Hereditary Clear. 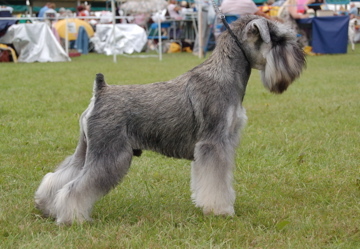 To date he has produced Blue Roan, Black & White and Chocolate Roan puppies. Dandy has proved himself a keen boy, he is compact, strong and typical of his line. Short coupled with excellent colour and coat. He has a lovely 'mini' attitude and has proved himself an excellent producer of strong, extrovert puppies. 'Dutch' had a wonderful temperament which he passed on to his puppies time after time. He produced excellent colour and coat, along with his movement which was truly superb.